Archer and Armstrong! The Eternal Warrior! Ivar, Timewalker! (And a very brief appearance by Faith!) 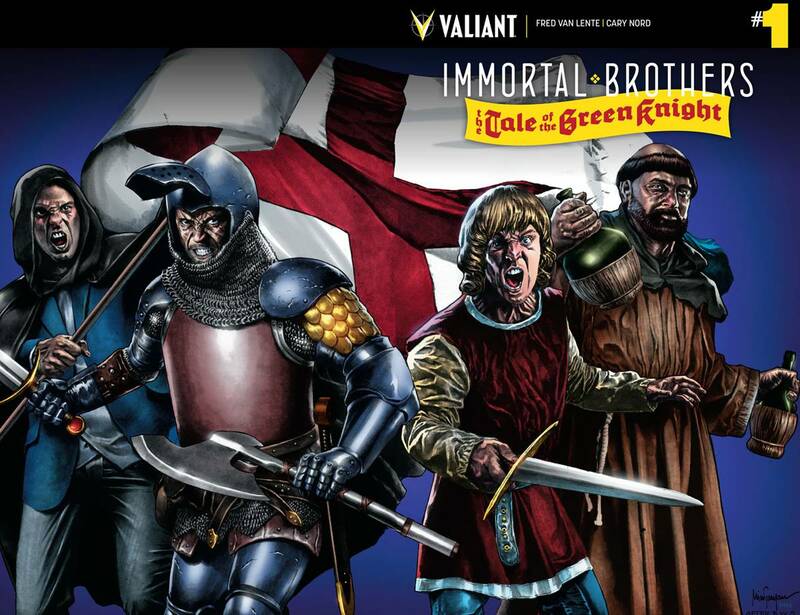 In the great Armstrong tradition of telling history as it really happened, join the immortal Anni-Padda brothers for a journey to King Arthur's court, where the true history of the monstrous GREEN KNIGHT is revealed! It's winter at King Arthur's court in Camelot, when the monstrous GREEN KNIGHT appears at the Round Table wearing no armor and bearing a gigantic axe. Eager for a challenge suitable for the weaker knights, he insists that they participate in a friendly 'winter's game'. Anyone can strike him once with his axe, but on the condition that the Green Knight may return the exact blow in one year's time. Arthur agrees to the game, but the youthful knight, GILAD, takes up the challenge to protect his king. Much to the court's surprise, the Knight doesn't move as Gilad strikes his head off. The Green Knight picks up his own head and gives Gilad his own mighty axe, telling him he is fated to receive the same blow before the year is out. Now, Sir Gilad must solve the mystery of who the Green Knight is before his hour at the axe comes to pass! But first, he'll need to find some help... in the form of his immortal brothers, who will be united once again! New York Times best-selling writer Fred Van Lente returns to Archer & Armstrong as Eisner Award-winning artist Cary Nord (X-O Manowar) joins in for an oversized, 48-page one shot epic!